Garifuna communities in Honduras are protesting an October 6th Honduran military police invasion of the only indigenous-directed hospital in the country, located in remote Ciriboya. According to eyewitnesses, 15 armed military police broke into the hospital in the early morning hours, later claiming they were searching for illegal drugs. No one was injured in the raid, which was timed during a hospital shift change. on their way to Haiti. February 11, 2010 – An international team of some 50 doctors trained at Havana's Latin American Medical School (ELAM) has arrived in Port-au-Prince to join Cuba's medical relief contingent in post-quake Haiti. Coming from a dozen countries, they are the first wave of ELAM graduates expected to number over 200 from 24 countries in the next week. They will join the 1,147-strong Cuban-led International Henry Reeve Emergency Medical Contingent, already comprised of 736 Cubans plus 402 ELAM graduates from Haiti, 7 from the USA and 2 from Nicaragua—together the largest medical relief effort in Haiti. Dr. José Ramón Balaguer, Cuban Minister of Public Health, speaking at the team’s sendoff last night, emphasized the long-term responsibility of the young physicians and their Cuban partners to “help build a public health system that meets the needs of all the Haitian people”. Dr Castillo and Minister Balaguer. Since the first class of 2005, ELAM has graduated 7,290 physicians from the Americas, Africa, the Mideast, Asia and Oceania. The graduates began organizing former classmates immediately following the earthquake, sending out thousands of emails, and recruiting hundreds willing to serve in Haiti. From all over Latin America they have come; from the Caribbean and the USA; and a few from as far away as Mali. Dr. Bechri Ahmed Ali hails from the Saharawi Arab Democratic Republic: “But Haiti is where I belong right now,” he told MEDICC. "This isn't an adventure. 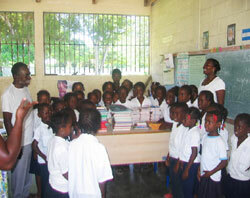 This is a commitment,” said Dr Wilberth Barral, a Bolivian ELAM graduate preparing to depart for Haiti. "My classmates are Haitian. Some lost their whole families, fathers, siblings, their homes. They need our help." Dr Betanco: "as long as necessary". None of the dozens of ELAM-trained doctors interviewed expressed anxiety about the open-ended nature of their assignment. On the contrary, said Dr María Esther Betanco from Nicaragua, "we'll stay as long as necessary, unconditionally." This is no small effort for many of these young doctors who themselves come from low-income families, and who will depend on networks back home to cover their absence. In preparation for departure, the ELAM graduates attended a week-long disaster course organized by the Latin American Center for Disaster Medicine (CLAMED), including modules on epidemiology, disease prevention, and vector control. They also had sessions in Haitian geography, culture, and history. In addition to a battery of vaccinations and basic materials every Henry Reeve volunteer receives before departure, each doctor also packed MEDICC’s trilingual Spanish-Creole-French Health for All Glossary of 4000+ essential health care terms. To date, the Cuban-led Henry Reeve Contingent in Haiti has treated over 65,000 victims and performed more than 3,600 surgical interventions in field hospitals, rehabilitation centers, and other health installations throughout Haiti. This is also the first time the Henry Reeve Contingent–which has provided health services in post-disaster Guatemala, Pakistan, Indonesia and elsewhere–will formally include ELAM graduates. The Contingent, named after a Brooklyn-born hero of Cuba's independence war against Spain, was created after Hurricane Katrina hit the Gulf Coast of the USA. Every day in thousands of places around the world millions of people suffer needlessly because of a lack of basic healthcare. Preventable diseases go untreated because of poverty and a lack of education. Many people parish from maladies that are simply unheard of in more affluent places. A lack of doctors, nurses and medicine coupled with little knowledge of basic hygiene make some lives intolerable. Poverty, neglect and outright discrimination keep those afflicted out of touch with basic care. In Honduras, we have taken RFK’s challenge and have helped to build a health care system that includes a hospital, a network of doctors and an organizational effort that can deliver the basics of life to a segment of Honduran society that has long been neglected. We have helped build a hospital in a remote area that serves over 20,000 people. We have delivered an ambulance to an area that once relied on foot travel and horseback for emergency service. We have also helped supply medicine to save lives and to improve the quality of those lives. We have set up 9 libraries in remote villages that have never had a library before. We have repaired a community services building in a very poor village that had no resources. Medicine and technical support to the staff that works full time in these remote areas have been delivered. But as the American Economy enters a cooling off period, we find our friends in Honduras facing a magnified need. Even in our own bad times Americans still want to reach out and help fellow human beings in other lands. Hope you can join us on April 17th to learn about our recent trip. This story originally appeared in Upside Down World. 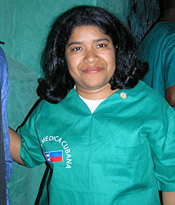 While the Bush administration has taken an increasingly hostile stance toward Cuba, U.S. and Cuban doctors worked together for the first time in May 2006 during an historic 7-day Medical Brigade to Honduras. The brigade, organized by Bill Camp, Executive Secretary of the Sacramento Central Labor Council, in collaboration with the Birthing Project and other organizations, provided badly needed medical care, medicine and supplies to the Garifuna people of the Atlantic coast of Honduras. 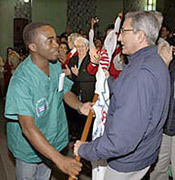 The brigadistas included 24 North Americans, 4 Garifuna physicians (all recent graduates of the Latin American School of Medicine in Havana), 2 Garifuna Interns, 7 Cuban physicians and 3 Cuban journalists. They served 3116 patients in the communities of Limon, Punta Piedra, Ciriboya, Tochmacho, Batalla, El Pino, Orotina and La Ceiba. The Garifuna are a unique cultural and ethnic group found along the Carribean coast of Honduras, Belize, Guatemala, Nicaragua and in the Carribean islands. They first appeared in this region over 300 years ago, when escaped and shipwrecked West African slaves mixed with the native Caribs who provided them refuge on Saint Vincent Island. Their language, Garifuna, derives from the Arawak and Carib languages. The Garifuna have kept their African musical and religious traditions over the centuries. "This brigade set a new standard for Americans to build foreign policy," said Camp. "We don't need George Bush to set our foreign policy. Here in California we are building a new foreign policy by expanding our cooperative efforts between Cuban and U.S. doctors and Honduran graduates of the Latin American School of Medicine." The next brigade of Cuban, U.S. and Honduran doctors to the Honduran Garifuna communities is set from November 8 thru November 18. Meanwhile, another medical brigade sponsored by AHMEN (the Alabama Honduras Medical Education Network), was in Honduras through July 18. The brigade participants provided general medical, pediatric, dental and vision care. They also offered continuing education for midwives, gynecological care and screening and treatment of cervical cancer. "The people in the Garifuna communities live off fishing and growing their own crops," said Kathyrn Hall-Trujillo, founder of the Birthing Project, who organized a number of volunteers from the project to participate in the brigade. "What they don't have is cash, cars and other resources. And access to health care is very hard in the remote communities." Parasite infections are a problem among the Garifuna, so the brigadistas brought plenty of "worm medicine" with them. The brigade doctors removed a foreign object from one young boy's ear, treated one guy with a partially chopped off finger and removed a silver from another man's eye, according to Hall. Another medical problem that has recently entered Garifuna communities is the HIV virus; Hall met one little boy whose parents had both died of AIDS. "The Garifuna don't know about AIDS and how to protect themselves from it, since they don't have electricity and aren't tuned into the radio, TV and other media," said Hall. "And the idea of wearing a condom goes against their whole culture." Bill Camp become introduced to the Honduran Garifuna communities when his brother, Dr. Tom Camp, requested his support in constructing the first community clinic in the Garifuna community of Ciriboya. In the process, Camp became acquainted with the Hondurans studying medicine in Cuba and decided to begin the medical brigades. Accompanying Camp and Hall were Birthing Project staff members Francisco Lefebre, Umsalaama Zaimah, CNM, Nonkululeku Tyehemba, Dr. Nevorn Askari, Elaine Quabner, Leona Spivey, Janeyne Sexton and RoLanda Allaha Wilkins; Bud McKinnney, Vice President, Local 162, Sheet Metal Workers Assocation, AFL-CIO; Dr. Cedric Edwards, the first U.S. graduate of the Latin American School of Medicine of Cuba; noted photographer Arnold Trujillo; and Phil Nelson, a retired Sacramento fire chief. All members of the delegation, including staff members, raised funds to cover the trip expenses. "It was a great trip and I learned a lot," said Nelson, who was born in Jamaica. "I was impressed that we saw over 3,000 people in just one week. It was clear that we were the only source of health care in the region. I will definitely go on the brigade again; those are my people and I was moved by the beautiful kids that I saw." Dr. Luther Castillo Harry, coordinator of the Community Hospital of Ciriboya, said the cooperative efforts by Cubans, Hondurans and North Americans are serving as a model for the future development of clinics and health care for Garifuna communities. "The Project Luagu Hatuadi Waduhenu (for the health of our communities) arose in 1999 as a initiative of the Garifuna students in Cuba seeking a way of contributing to the betterment of the health of our communities," said Harry. "We decided to donate 15 days of our month of vacation working in the Honduran Garifuna communities, shoulder-to-shoulder with the Cuban doctors." Harry cited the case of a 90-year-old grandmother who said, after being treated by a Garifuna doctor in the maternal tongue for the first time, "Now I can die -- it is the first time that a doctor has examined me without disgust." Not only was the May brigade great for the patients, but also for the doctors themselves. "It was fantastic to have Cuban, U.S. and Honduran doctors all treating one patient," said Camp. "The American doctors learned from the Cuban doctors, while the Cuban doctors learned from the U.S. doctors. And the Hondurans were able to share their expertise in working in the Garifuna communities with the Cuban and American doctors. It was a very exciting experience." Sponsors of the medical brigade included CHIMES (California Honduras Institute for Medical Education and Supplies), PINCC (Prevention International Cervical Cancer), AHMEN and Project Luagu, Hatuadi Waduhenu. For more information, call Kathyrn Hall at 916-284-6330 or Bill Camp at 916-927-9772.